Whatever happened to Danie Ian? 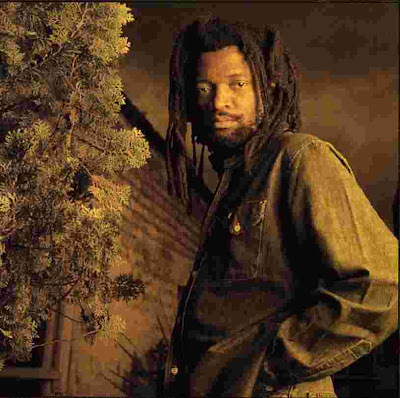 Singer/guitarist Danie Ian (pronounced "eye-AN") is perhaps one of the most tragically undersung heroes in the annals of Nigerian popular music. A founder of not one but two of the most seminal bands of the rock era, his lack of greater renown is an unfortunate accident of timing: His career peak just happened to have coincided with an epoch that history has simultaneously judged to be a golden age and a lost era. In 1966, as Nigeria shuffled toward its sixth anniversary as an independent nation, its fragile democracy was displaced by two military coups in rapid succession, simmering ethnic rivalries boiled over into fult-tilt carnage, and Nigeria would greet the next decade as a country at war with itself. It's safe to say the honeymoon was over. Apparently, 1966 was also the year that Daniel Ian Mbaezue formed his first pop group, The Spades (some accounts give the year as 1968)--which would go on to be one of the most influential bands of in Nigeria's embattled Eastern Region, and eventually one of the most beloved bands in the country as a whole--albeit without him. Mbaezue was born in the village of Umuezeawala, outside of the town of Ihiala in present-day Anambra State. 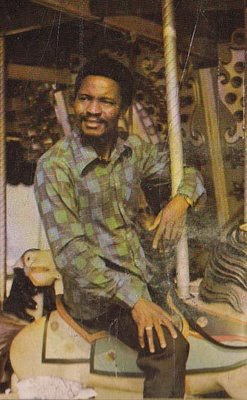 Daniel showed an early propensity for music, playing flute and drums in his primary school band, leading the school choir at Abbott Boys Secondary School and remaining active in school music activities at Holy Ghost College in Owerri, Imo State, from which he received his Higher Studies Certificate in 1964. In 1965, he returned to Ihiala to teach at his alma mater Abbott Boys, but his interest in music continued. During those turbulent times, the buoyant optimism and aspirations to elegance represented by dance band highlife had lost a bit of its luster and the new youth generation had turned more towards "beat" music--funk, soul and rock & roll. Where once a youths interested in music sought to learn the trumpet and join a highlife orchestra, they now picket up guitars and formed rock bands like The Blue Knights, The Cyclops, The Strangers, Hykkers International, The Soul Assembly and The Clusters. Mbaezue reports that he bought a guitar with his very first paycheck and shortly thereafter assembled The Spades. In May 1967, the governor of the Eastern Region, Lt. Col. Chukwuemeka Odumegwu Ojukwu declared that the region had seceded from the Nigerian federation and would effectively be known as the independent nation of Biafra. Nigeria promptly dedicated all its military resources to crushing Biafra and re-annexing the oil-rich land it stood on. Biafra soon became a blockaded teritory, with Nigeria barring food and medical supplies into the region, leading to an estimated one million Biafran casualties, with a good percentage of those being civilians that succumbed to starvation and disease. 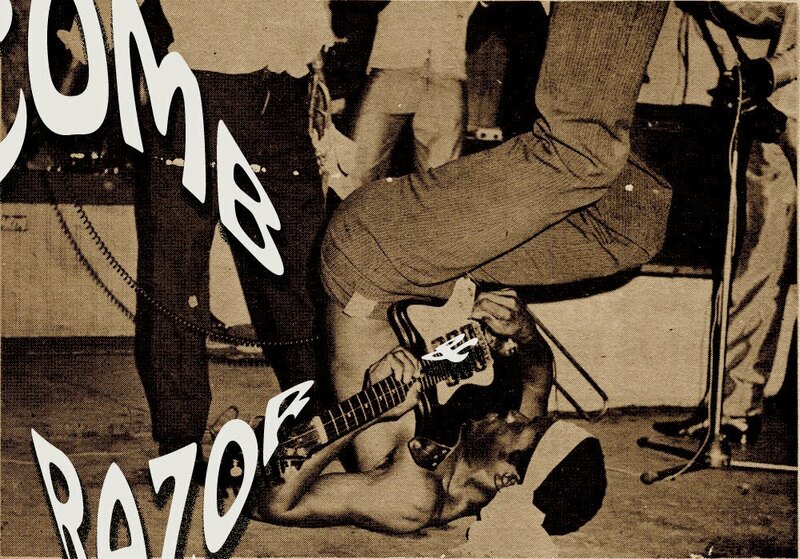 Through all that, though, Biafra managed to maintain a fairly vibrant music scene. Little is remembered about most of the wartime bands, as for obvious reasons they got few opportunities to record. And of the few recordings that were made, few survived the devastation. (One With Comb & Razor reader once described to me driving through the ravaged city of Onitsha shortly after The War and seeing a long stretch of a major road littered with broken 45s.) As such, we know little about bands like The Figures and The Spades that played in Biafra, chiefly entertaining the young soldiers. Perhaps because of this reputation for lifting the spirits of combatants in the war zone, by 1968 The Spades had become known as The Airforce Wings. When The War ended in 1970, Airforce Wings became simply "The Wings" and soared even higher, their achy-hearted rock and pop serving as a salve for the battered souls of the country's youth. But The Wings' postwar success was achieved not behind charismatic frontman Dan Ian but with new lead singer Emeka Jonathan "Spud Nathan" Udensi; Ian had been lured over to The Strangers in late 1970 and in 1971 moved to Lagos to join Sonny Okosuns' Paperback Limited. Ian's spell with Okosuns was similarly short, and by 1972 he had formed the band with which he is most associated: Wrinkar Experience. Not much is known about the group (which was active for only six months between 1972 and 1973) and I've never seen a photo so I'm not sure about the composition of its membership. All I can say for certain is that the lineup included Ian on guitar and lead vocals, Cameroonians Edjo'o Jacques Racine and Ginger Forcha (on bass and guitar/organ respectively). Ian seems to have been the primary songwriter, penning the two singles for which the band is best known: "Fuel for Love" and "Money to Burn." Wrinkar Experience - "Fuel for Love"
Wrinkar Experience - "Money to Burn"
At the height of Wrinkar's fame, Ian left the band "in protest against exploitation." Wrinkar Experience briefly carried on without him until Forcha and Racine formed a new band, Rock Town Express. If one were to make an assumption about Danie Ian's temperament based solely on his in-and-out relationships with various bands between 1970 and 1973, one might be tempted to view him as mercurial, territorial, perhaps a tad attention-hogging. After the Wrinkar split, Sunny Okosuns considered re-drafting Ian to sing lead vocals on his breakthrough hit "Help," but feared Ian would attempt "steal" the song by taking credit for its composition. Instead, Ian put together a new band called The Ace of Spades and recorded a handful of singles, including "Love Me Now," "Keep It Top Secret" and "Lady Gay Girl." Danie Ian - "Lady Gay Girl"
By 1976, Ian had shortened the band's name to The Spades in tribute to his original group and released the album Chapter One: This Unspoken Love, dubbing his sound "Love-Dayrock." 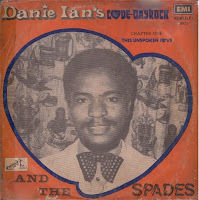 Danie Ian & the Spades - "This Unspoken Love"
Danie Ian & the Spades - "Got To Stay Mine"
Danie Ian & the Spades - "I Need Somebody To Love"
The album was issued by EMI in Nigeria, but was also released on Pathe Marconi in France as simply Danie Ian & The Spades. It does not appear to have made much of an impact in either market. 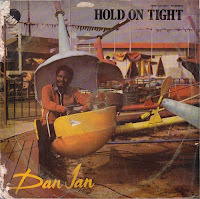 In 1978, Ian ditched he Spades and teamed up with the Heads Funk rock band of Port Harcourt for Hold On Tight, an album of mostly mellow reggae-style tunes like "She's My Woman." Dan Ian - "She's My Woman"
Apparently, the album's hit was a song that diverged from Ian's usual romantic pop format. "Uri Oma" evoked Igbo native blues and performed well in regional Igbo markets. Dan Ian - "Uri Oma"
On the mainstream level, though, Hold On Tight mostly went unnoticed. The audience was changing; the new generation seemed more interested in new genres like disco and boogie and even the re-energized guitar highlife scene. Dan Ian's beat pop seemed to be just as much of a relic as the old school dance band highlife it had supplanted a decade earlier, a souvenir of a dark age they would rather have forgotten and memories they wished would just disappear. And so Danie Ian did just that. He disappeared. The former heartthrob went back to his hometown, where he was honored with the title Chief Dan Ian Mbaezue, Ezeloma Apanike of Ihiala. But music was never far from his heart. Citing the success of "Uri Oma" as an influence, he charted a new artistic direction in the world of traditional Igbo music and highlife. 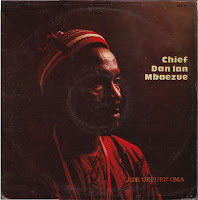 In 1990, a mature and near-unrecognizable Dan Ian returned to the music scene with the LP Jide Ukpuru Oma. Chief Dan Ian Mbaezue - Edikata Ndidi Obi Agbowasia"
Chief Dan Ian Mbaezue - "Mmiri Si N'Isi Gbaru"
And then, just like that, he was gone again. Which brings us to the question at the top of this post, one that I have been asked several times since I started writing about Nigerian music on this blog: Whatever happened to Danie Ian? I regret that at this time, I have no definite answer as to his activities of the last 18 years, but most people seem to be unaware of anything he did after Wrinkars, so I hope I've filled in some of the blanks at least. As one who was not even born when "Fuel for Love" was released, I can only imagine the tremendous effect it had on the kids that came up in the shadow of The War. I can hardly think of a single song that elicits as passionate a response; you need only hum a few bars of "Fuel for Love" in the presence of any gathering of pentagenarian Biafra babies and and watch them go wild. I believe he is alive and well, though; rumor suggests that he works as a palm wine tapper in his village, but as he's probably pushing seventy by now, I hope he's not still climbing those trees! The last major Dan Ian sighting was in October 2006, when he traveled to Lagos for the "Legends Night" event held by the Performing Musicians Association of Nigeria. As audience members requested old favorites by the likes of highlife maestros Dan Maraya Jos, Oliver De Coque and Raphael Amarabem, Dan Ian was summoned to the stage to perform "Fuel for Love." And so he sang, and they danced like it was 1972. And for one night at least, Danie Ian got the recognition he deserved as a legend of Nigerian music. Well... Let this be another night for him. Who were Sons of Izzu? Wish I could say I knew. Hell, I wish I could say I knew what year their album Ago Follow You Go was released. But since the record sleeve gives us none of this information, we'll do the best we can to sketch a general portrait using the few context clues we do have. 1. They were an Igbo highlife group. While they do not sing in Igbo, this is obvious due to their bouncy, Ikwokilikwo sound and the subtitle "Anambra/Imo special," a reference to the two main Igbo-speaking states in Nigeria at the time. 2. 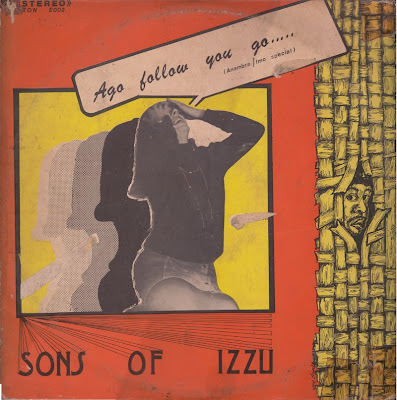 This LP was recorded some time after 1975, the year Ikenga Superstars of Africa released Ikenga in Africa, which popularized this style of hard-driving, pidgin English highlife. Probably even after Prince Nico Mbarga's 1976 Sweet Mother, whose massive success across Africa and the Caribbean thrust this kind of sound into overdrive. 3. Like Mbarga himself, this LP is a Cameroonian-Nigerian creation. The only credited session musicians are Edjo'o Jacques Racine (bass), Ginger Forcha (guitars) and Feliciano Sango (a.k.a. Felix Nsango, percussion), a trio of Cameroonian rock musicians known as Rock Town Express. 4. The record was produced by Tony Essien, a musician and producer from Akwa Ibom State who often worked with Rock Town Express, and released on Essien's own Supertone label. This record would have been made before Essien assumed the position of chief producer and creative director at Haruna Ishola's Phonodisk label in 1980. I love it when readers send stuff in... Not just because I'm genuinely interested in other people's insights, experiences and information, but also because it relieves me of the responsibility of having to generate new content for the blog! So today we have an essay and a mix celebrating the influence of Fela courtesy of Washington DC-based journalist Iwedi Ojinmah... Enjoy! I remember seeing him for the first time just as if it was yesterday. Through the clouds of smoke and altered by the “come hither” glow of red and blue bulbs that ordained the club, he stood with relative ease…. an omnipotent symbol of a bold and angry new Africa. I was instantly mesmerized and would be for life. He was bare chested and seemed oblivious to the thin film of sweat that defied the cool wind being dispersed by huge ceiling fans above and that covered his sinewy ebony frame. One circle - in what must be some type of traditional Yoruba chalk - encircled one eye making him look more like a winking raccoon than arguably Africa’s most vibrant singer slash activist. He has now evolved into a far cry from the trumpeter of the Cool Cats aka Koola Lobitos that had once played highlife and modeled evening gear for fashion magazines. Ladies and Gentlemen... the place is Ikeja. It is the late 1970s and the location is The Shrine, and Fela Anikulakpo Kuti’s famous “Yab them Night” has just kicked off. I had picked a good night. Well, make that "we." Stowed away from High School thousands of miles away in the East, my friends and I had travelled all the way to Lagos by “Air - Chi Di Ebere” just to see “Baba” live. We, as well as the rest of Nigeria, had just been hypnotized by that first killer LP that featured both “Shakara” and “Lady” and rather than buy another pair of platform shoes, or Brutus jeans had saved our pocket money to make this hajj possible. For the first hour it was a non stop jam session of some of his greatest work. Looking back now we can only “Thank God” that he had yet to release such great master pieces as “Water No Get Enemy” or “Africa Center of The World” because as we know Fela was not just a great performer, but a shrewd businessman and refused to play any song you could buy for yourself on wax, tape or 8 track. 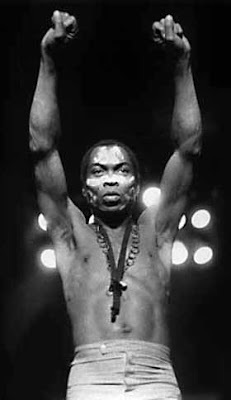 In as much as they were still being worked on then they were already timeless classics even in the pupa stage and “Fela” delivered them with unparalleled showmanship. In between sets his tongue wagged like a hyperactive “bulala” as he called out everyone from President, to the Pope, flogging even his own Brother Beko who was the then equivalent of the nations Surgeon General with it, as well as a gaggle of other “useless” “Madams and Ogas”. Not in fear of the jack booted thugs in uniform that had repeatedly suffocated arguably Africa’s most vibrant Press in the past, that night Music was his Weapon as we remained in stunned silence - soaking everything in. By nights end most of us had made a conscious decision to remain either part of the disease or become part of a cure. I say this because out of the four of us that witnessed sheer magic that night 2 would end up being journalists and the other 2 lawyers. Fela would rewrite that art of confrontation using both satire and an in your face type of challenge virtually new to Africa. This would catapult him to instant super status especially in Ghana, his old stomping ground, and in South Africa where Hugh Masekela would virtually change his new band's format and style even dedicating his maiden album entitled The Boy's Doing It to Fela himself. 60 years later his respect has not diminished one iota as we hear in his ode to Fela on the album Sixty which not just brings tears to your eyes but also tugs at your heart. He would be the first to actually name names in his songs starting with the fabled "I.T.T." in which he questioned not just then-chairman Abiola’s dubious “modus operandi” but actually mentioned then-President Obasanjo by name. As we know this would set into motion a hateful relationship with the Nigerian Army that would not only span decades and play an unfortunate role in his Mother’s death, but also lead to his incarceration in Nigeria’s coldest and dampest prison located in Jos. In as much as his body was already being ravaged by the HIV virus, it was here that he would catch the actual pneumonia that would cause the heart failure which killed him on August the 2nd, 1997. This is made even more unfortunate when we look at the likes of, say, a Magic Johnson today, who has shown us that having AIDS does not necessarily translate into an instant death and that Fela despite being infected then could have easily lived on with today’s new drugs and given us 20 or 30 years more of sheer ecstasy. Years later while working at The National Public Radio in Washington I would hear a nightingale-like voice emit from one of the studios and carry through the myriad of its hallways. It wasn’t so much that it was beautiful but it was what it was singing that galvanized me into an almost trot – seeking its source. Stunned I peeped in and looked at the bald head of Sinead O’Connor (then arguably the epitome of controversy and female activism) “blowing” Fela’s “Lady” in perfect pidgin. Later on I would learn that she was preparing for the Manu Dibango’s "Wakafrika" tour and all I could do was just shake my head and smile. I mean here was one of the ultimate feminists of her time singing a Fela song that without a doubt if not encourages sexism certainly winks at it, and she didn’t even know. Rather, with eyes closed, she attacked each line with such energy and passion that one despite her pigmentation, could have easily mistaken her for one of the Kalakuta Queens. Fela himself must have been proud and smiling at the fact that not only does his music continue to live on with efforts put forth by his sons, but also in projects like Red Hot + Riot and by bands like The Roots and singers like O’Connor. Bearing this in mind, he can really Rest in Peace knowing that (and I quote the NY Times) "Afro beat offers plenty of room for allies and kindred spirits, without ever surrendering its own stubborn identity." And to that we can only add an "Amen" and a "Thank God." Thanks a lot, Iwedi! And all you old heads out there... I'd love it if you shared your recollections too! Say what you will about the man, but Kanye always comes out with the fresh videos (this one courtesy of the brilliant Nabil Elderkin. In a serendipitous twist, the video's datamoshing technique--which does with video artifacts what Jimi Hendrix did with amp feedback--also features in the video "Evident Utensil" by the band Chairlift, released last week. As a result, Kanye will probably not officially release the "Welcome to Heartbreak" vid so as not to look like the idea was swiped from Chairlift. I think Kanye's video is better, though. 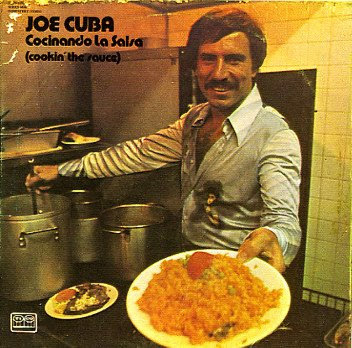 SAN JUAN — Salsa band leader Joe Cuba, dubbed the "Father of Latin Boogaloo" for weaving a fluid, bilingual mix of musical influences, died Sunday in New York City, a member of his group said. He was 78. The musician, a friend and contemporary of the late salsa giant Tito Puente, died from complications of a persistent bacterial infection at Mount Sinai Medical Center a day after doctors disconnected his life support, said Cheo Feliciano, a longtime friend and singer in the Joe Cuba Sextet. Cuba had fought the infection for several years. Born Gilberto Calderon in 1931 in New York to a family from Puerto Rico, the band leader and conga player helped change the sound of salsa in the 1960s, Feliciano said. Until then, most popular salsa had been played by orchestras, he said. But Cuba led a six-member band with three singers who also played percussion and danced a routine. "He had a dynamic group," with a signature vibraphone-fronted sound that "caused a craze because it was different," Feliciano said. Albums such as 1966's Bang! Bang! Push, Push, Push incorporated elements of salsa, Latin jazz and R&B and featured lyrics in both English and Spanish. Cuba, whose musical career took him on world tours, was inducted into the International Latin Music Hall of Fame and became director of the International Salsa Museum in New York's East Harlem. In his 70s, he was confined to a sick bed for three years after contracting a staph bacterial infection while being treated for asthma at a hospital. After care in hospitals, a nursing home and at his New York home, he resumed performing in 2006. Feliciano said he spoke to Cuba by telephone from Puerto Rico just before Cuba died. "I told him that God has a mission for all of us, and when we've come to the end of the mission, we have to go to the place we came from," said Feliciano, who debuted as a singer in the sextet in 1957. The band leader's remains are expected to be interred in Puerto Rico. As I said in my last post, the Ghanaian dance bands of the 1950s and 60s tended to have little confidence in the trumpet-playing abilities of their countrymen and so often hired Nigerian trumpeters instead. Many of these trumpeters came from the Calabar area, which was noted for its brass band tradition. The greatest and most influential of these Calabar trumpeters was probably Sammy Obot. 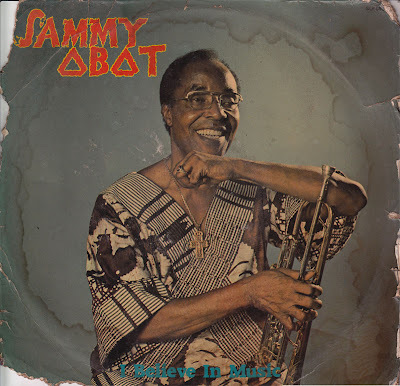 Samuel Obot started his career in 1944 as a member of the Nigeria Police Band in Lagos. He then moved to Port Harcourt where he fronted his own band for the next couple of years. A teenaged trumpeter named Erekisoma "Rex" Lawson apprenticed with him, learning from Obot the expressive, muted tone that would become his trademark as one of the most popular highlife stars of the 1960s. 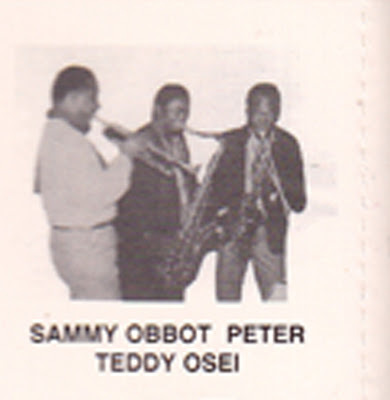 Other musicians who studied the trumpet under Obot included Victor Olaiya and Sam Akpabot. Obot then moved up north to Kano, where he led the Rendezvous Dance Band featuring Efik singer Inyang Nta Henshaw, who was one of the most popular musicians in Northern Nigeria. As the Gold Coast approached independence in 1957, Obot moved to Ghana and founded the Broadway Dance Band. Broadway Dance Band - "Hunua"
Obot led the Broadway Dance Band as they played at the independence ball and soon became the unofficial national orchestra of Ghana, performing at state functions and accompanying Kwame Nkrumah on presidential trips. In 1964, the Broadway Dance Band changed its name to the Uhuru Dance Band; Obot handed leadership of the band over to Stan Plange the following year and moved to London where he participated in the local black music scene and studied at the Eric Guilder School of Music. 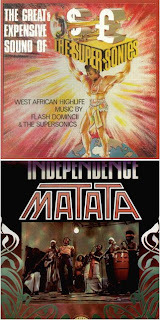 Notable sessions he played on during this period include Flash Domincii's The Great and Expensive Sound of the Supersonics in 1967 and 1974's Independence, by afrofunk band Matata. Flash Domincii & the Supersonics - "Igbehin A Dara Fun Wa"
Matata - "Good Good Understanding"
Obot returned to Nigeria in the 1970s and continued to perform until 1985 when he released the first (and to my knowledge, only) album under his own name, I Believe in Music, issued on the private Sagata label. Looking at the record sleeve now, I'm amused to note that Sagata Records International's main office address is given as "55B School Road, Housing Estate, Calabar"; this was the home address of my across-the-street neighbor, Calabar businessman Chief T.A. Obot. While this record was released about two years before we moved there, I had always had a couple of friends who lived in that neighborhood and so I hung out around there a lot. The Obot residence was a big white house surrounded by an intimidating wall. Chief Obot's daughter Lucy went to the same primary school as us, and everybody thought she was kind of stuck up. I do recall hearing that the famous old-time musician Sammy Obot was her uncle and seeing her in the "I Believe in Music" video (shot in the University of Calabar staff quarters, where I did live at the time). I thought that she thought she was all that. In retrospect, I guess she was just really sheltered; almost nobody was allowed into their compound unless you were going into Luciana Hair Salon (the small beauty parlor Mrs. Obot ran out of an extension at the front of the house; my sisters used to get their hair relaxed there occasionally, but not too often because Luciana seemed to be more expensive than most other salons and kind of cliquish, too), and I don't think she was encouraged to play with other kids in the neighborhood, even though she clearly wanted to. Taking what I know about the Obots' business instincts into account, I can imagine that the goal was for the record to appeal to as wide (and young) of an audience as possible, and so they contracted the hottest producer in Nigeria for the job. And instead of Sammy Obot's familiar dance band highlife you get Jake Sollo's late-period technofunk, with Obot singing in Efik and English. The sleeve shows Obot brandishing his axe, but he doesn't play a single note on the entire album. What little trumpet there is, is credited to Roxy Edet; Jake Sollo handles synth sax and all other synthesizers, programming and arrangements. The rest of the musical crew is made up of regular session players associated with Sollo productions during his Onitsha/Awka period: guitarist Eddy "Pollo" Neesackey, bassist Ernest Mensah, and background vocalists Veno Marioghae, Al Jackson Nnakwe, Mary Udekwu, Nkem "Ozzobia" Njoku and Murphy Williams (formerly of Apostles of Aba). I'm not sure how I Believe in Music was received in the rest of the country, but I can say with certainty that it got a lot of play in Calabar and became something of a sentimental classic. When I found this record last summer, even Koko--Koko, who usually resents my obsession with tracking down these old records--cackled with delight when I brought it back the house and listened to it from beginning to end, singing along gleefully. I don't know if Sammy Obot is still around and/or active, but big ups to the master! Sammy Obot - "Mbon Sca Re"
Sammy Obot - "Edue Ukot Akpa Itong"
Sammy Obot - "I Believe in Music"
EDIT: There was some sloppy editing at the beginning and end of "Edue Ukot Akpa Itong," but I've fixed it now. When Ghanaian trumpeter E.T. Mensah arrived in Lagos with his Tempos band in 1950, he introduced Nigerians to a brassy and vivacious new dance sound that had been developing back in Accra since the late 19th century, combining the rootsy flavor of various street rhythms of the West African coast with the urbane elegance of Western ballroom music. Highlife, they called it back in the Gold Coast. Within a few years, all the top Nigerian ballroom orchestras had ditched their waltzes, swings, foxtrots and quicksteps and hitched their wagons to the highlife train. 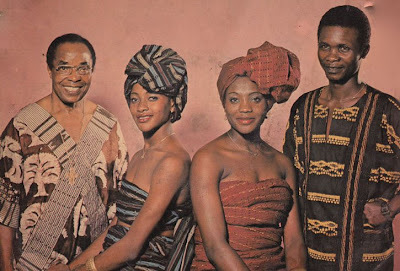 From that point on, highlife would develop in parallel between Ghana and Nigeria, with the Nigerians devising quite a few innovative permutations of the genre through the 1970s and 80s. 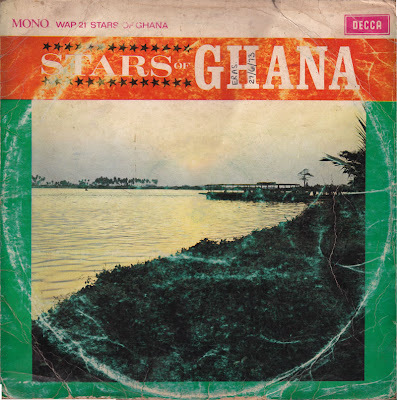 Still--for this listener at least--the definitive highlife sound will always be the jaunty, opulent music plied by the Ghanaian dance bands of the 1950s and 60s. 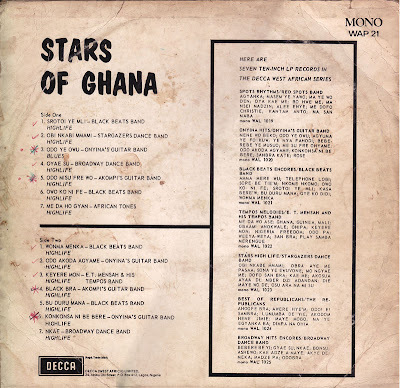 Stars of Ghana was an influential compilation featuring a sampling of these Ghanaian bands as represented in Decca West Afrca's bestselling series of highlife recordings in the mid-to-late-60s. The King of Highlife, E.T. Mensah with his Tempos; the Black Beats, led by the great King Bruce; the Stargazers, featuring saxophonist Teddy Osei and drummer Sol Amarfio (both of whom would go on to found Osibisa) and led by legendary trumpeter Eddie Quansah; and the Broadway Dance Band, led by Nigerian trumpeter Sammy Obot. As much as I love the big brass brands, some of my favorite Ghanaian groups from this era were the guitar bands such as King Onyina's and Akompi's. Working with much smaller combos and without the added volume of horns, trap drums or (in some cases) even bass, they managed to approximate the voluptuous texture of the orchestras with just nimble fretwork, chromatic chording and wailing vocal harmonies. The guitar playing on all these records is quite colorful, actually... Over the summer I was fortunate to attend a seminar on highlife at which Stan Plange of the Broadway (later Uhuru) Dance Band and guitarist Ebo Taylor both asserted that Ghana always had the best guitar players but suffered a dearth of decent trumpet players and and so always looked to Nigeria to recruit trumpeters. State witness Mpho Maruping said her husband had confessed his involvement in Dube's botched hijacking and gave her details on what led to the multi-award-winning superstar's death. As Dube's relatives sobbed, the woman told the Johannesburg High Court of the night Dube was shot as he dropped off his son and daughter in Rosettenville. Maruping is the wife of Thabo Maruping. He was initially charged with Dube's murder but turned state witness. She said her husband and three men on trial for murder, robbery, attempted robbery and illegal possession of firearms - S'fiso Mhlanga, Ludwe Gxowa and Mbuti Mabe - had been on the prowl, hunting for a Chrysler to hijack. After their search proved fruitless, they parked their VW Polo and waited. Then a Chrysler drove up and stopped not far from them. They pounced. Two shots were fired. Dube tried to drive off but he crashed his car into a tree and died on the spot. Maruping said that on October 18, the day Dube was killed, she and Thabo were in Sandton at a timeshare meeting. Thabo kept receiving phone calls and later arranged to meet the three accused in the Joburg city centre. Maruping said she asked her husband why Dube was shot. "He said Mhlanga said he did not see that it was Dube and had thought he was a Nigerian. When you think about it, that's really messed up on a couple of different levels. For real though, is it still like that down in SA? Anyone? The Calabar of my childhood was not today's affectedly quaint, glossily-packaged tourist trap but a city lost in time. Back then, the town's strong connection to the past was not yet exploited as a marketing hook. In fact, it often seemed like an oppressive burden--weighing it down, dragging it back and keeping it perpetually out of step with the rest of the country. It was a ghost town where shadows of the glorious path were an everyday, almost suffocating presence. I became aware of this soon after we moved into town. I was sitting in the Volvo with my dad, parked on Calabar Road while we waited for my mother who had gone up the street to Uruawatt (Watt Market, named for George Watts, the Liverpudlian merchant who helped establish Calabar as a major trading post in the 1880s). Here, in the heart of historic Old Calabar, surrounded by dusty, colonial architecture, my eye was drawn to the central post office (built in 1891, it was the oldest post office in Nigeria--and believe me, you could tell just by looking at it)--or rather, to the garish posters plastered on its outside wall. Most of them advertised the latest Bollywood and Bruceploitation extravaganzas screening at Patsol Cinema, but a couple of them were slightly faded placards that looked like they had been up for maybe a few months, announcing an upcoming performance by someone called Rex Lawson. "Who is Rex Lawson?" I asked my dad. "He was a musician who was very popular all over Nigeria," he said. "He's dead now." "A while ago... During The War. Or shortly afterward. I think it was 1971." I should mention at this point that this conversation was taking place in the year 1981. But that was Old Calabar for you: trapped in a twilight zone where Rex Lawson had never died and neither had horn band ballroom highlife, despite the rest of the country having agreed that it was yesterday's news ten or thirteen years earlier. 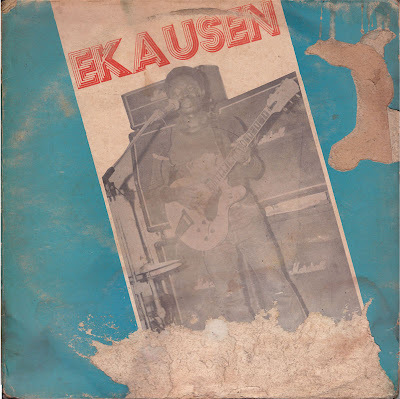 And so a youth would hear songs from the album Ekausen by local musician Bassey Archibong played on Cross River Radio almost every morning while getting ready for school. This is another record that I pretty much note-for-note, beat-for-beat. Of course, listening to it now I am a thousand times more appreciative of it. As I've said before, I used to think of all of this Calabar brass band stuff as "old man music," but knowing what I know now, I recognize that there is a lot more than simple nostalgia happening on this record. There is a youthful vitality that differentiates it from the elegant languor of old-timers like Inyang Henshaw and it does acknowledge various developments that occurred in music since the end of The War. Some of Archibong's guitar licks evoke the Ikwokilikwo, craze and the drums and especially the keyboards on "Nsese Owo," "Nne Nne" and title track tip their hats to Sonny Okosuns' Ozziddi beat. Ah, well... Thank God for these fragile vinyl memories.